Wednesday's "Week of Wishes" takes us to West Virginia where we met Karen Byrd. The devoted mother of five says as much as she loves all of her children, she is determined to make something special happen for her middle child, Pauletta. Byrd has been writing regularly to The Early Show's "Week of Wishes" series. This time, her letter was picked up. In it, she writes, "This is my fourth e-mail concerning my daughter, Pauletta Holley. She doesn't work. She is in a wheelchair from a car wreck 15 years ago. Her life has been one setback after another since her accident." A car crash left Pauletta Holley, then a 26 year-old divorcee, a quadriplegic – paralyzed from the breastbone down with use of her arms and limited use of her hands. Holley says, "The first years I stayed in bed a lot. I didn't even want to get out of bed. I didn't want to do nothing. She had to practically take care of my kids for me. She took care of me. She worked. She took care of everything." The once vibrant, independent mother of two boys was lucky to be alive, but totally dependent on others and very angry about it. She says, "I think I gave my mom a really rough way to go. I was really hard on her because I was just absolutely totally miserable." Fifteen years later, acceptance has replaced anger. Holley's come a long way, but the journey to reclaim her independence has been slow and painful for her mother to watch. Byrd says, "My wish, for my daughter, is to be able to go somewhere and enjoy the day and make memories." It was Byrd's wish to have Holley meet with someone who knows first-hand about the challenges of rebuilding a life after a tragic accident. The women had no idea a whirlwind trip to New York would include a surprise meeting with the man of steel himself, Christopher Reeve. Surprised, Byrd gives Reeve a hug from her daughter and Holley and Reeve complimented each other on their looks. "You look better than what I seen you on TV," Holley says. He asks, "Have you seen me since I, they, shaved my head? It's the Lex Luthor look instead of Superman," he notes with a laugh. If only for an afternoon, the two very different lives intersected: Reeve and Holley shared the things they had in common, like wheelchairs, and finding a life while in one. Holley asks, "I wanted to know if you stayed in a lot of pain." Reeve says, "I'm very, very lucky that pain hasn't been an issue. But I know, it is for so many people. Like one of my real big problems was temperature sensitivity; it was just unbelievable. Sometimes, during the night, I'll wake up maybe five times." Byrd asks, "Do you have any advice for mothers and fathers who their child is a quadriplegic or a paraplegic now, and where they could go, what they could do?" Reeve notes, "I was injured in 1995, we had no idea what to do. You know, where's the best place to go for rehab. I had no idea what kind of a van you get, or a wheelchair or whatever. Now, you can go just to Paralysis.org. And people log on from all over the world. And we've gotten government funding as well as private funding." To Holley, he says, "You also think you're never going to have a life. And that's the part that I know that you went through for a couple years, and I went through for a while, too. Where you feel like a life like this isn't worth it. I felt incredibly guilty for having been injured. And I know with kids, you really must have felt that, too." "I still do," Holley admits. Reeve continues, "Yeah. But that's something you have to forgive yourself for. And wasn't your fault. So, it's about getting past it and then you got to get over the idea that you're going to have no life - because you can have a life." Back in The Early Show studio, Holley tells co-anchor Rene Syler it was fun to meet Reeve. He gave her the Web sites included at left to look into. But Holley says her computer broke down. Well, Bob Barris, a vice president of Dell Inc., knew what to do when he heard that. He came up to her and presented her a gift certificate for a Dell dimension desktop computer. And since Byrd's letter called for creating new memories, Syler presented Byrd and Holley a seven-night cruise for two courtesy of Travelocity and Norwegian Cruise Lines. 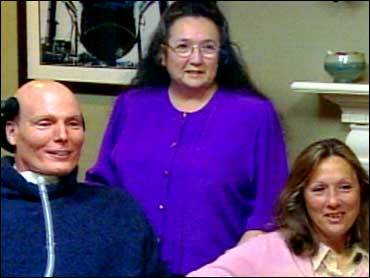 Christopher Reeve's wife Dana also joined Holley and Byrd at the studio. Dana Reeve is the director of the Paralysis foundation and she says a huge milestone for her husband now is being able to go 18 hours off of a ventilator. She says, "Coming off the vent for 18 hours is due to a surgical procedure that he had. Which was a diaphragmic pacer which makes it easier to come off the vent and able to breathe." He will be speaking without the ventilator at a fundrasing gala. Dana Reeve says, "It it will be the first public appearance for him to speak without the use of a ventilator." The following is information about: The Christopher Reeve Paralysis Foundation's largest gala fundraiser to bestow Visionary Leadership Award. Joel Faden, Joel Faden and Co.
"Paralysis Resource Guide" - Provides information to those who have recently become paralyzed and their caregivers. Information such as: health management and wellness, paralysis research, active living, travel, tools and technology, rehabilitation and caregiving. Information about the book can be found at paralysis.org or by calling (800) 539-7309.